I have a special treat for you today! I’ve asked my fabulous virtual assistant, Kaitlyn Bouchillon, to share her heart with you. Kaitlyn helps me with editing, social media, creating graphics and a variety of other things. She’s gifted, gracious, brilliant and keeps me on track. I’m so blessed to work with her! I heard once that God is the one who overcomes — and because He does, we can come over. That sounds like really good news for me right now, and maybe you too? There are days – maybe weeks, months, or even years – when there are more questions than answers, more things up in the air than things we know for certain. The times when someone you love dearly is sick, a relationship is falling apart, the bills are stacking up or the kids are running you wild. Even when life is topsy-turvy and spinning a bit out of control. Even when it feels like you’re carrying the weight of the world on your shoulders. Even when your hands are full. Because there is One who has overcome. And so we can come over. In the Bible, before the curtain was torn in two, the Holy of Holies could not be entered into by just anyone. You and I, we would not have been able to approach the place of the Lord’s presence. The curtain would have separated us – not from His love, because oh friend, how He loves us! – but from His beautiful, consuming, powerful presence. But when Jesus Christ died as a sacrifice, the curtain that kept the distance and created a separation was torn in two. From top. to. bottom. It was nothing man could do, but God did it for man. He entered into our mess and invited us into His presence. We can come over. Maybe it’s not about knowing all the answers but trusting the Answer. And maybe the world that feels like it’s on your shoulders is really in His (more than capable) hands. You can stop climbing mountains and wondering if you’re enough because the truth is: Christ in you is BEAUTIFUL. So hold onto hope, friend. Choose to believe He’s got it all figured out and His plans are so very good. Remember that the time spent worrying is time taken away from praying for the very things that cause us to worry. Slow is a frame of mind and today we can pause and choose to come over. We may not know all the answers, but we can know the One who does. p.s. Can I let you in on a little secret? I wrote these words for you — but I also wrote them to myself. In less than three weeks I’ll be walking across a stage in a cap and gown. I’m so excited and also terrified. There are so many unknowns. But. He has proven faithful in all things, at all times, in all ways. God has clearly marked the path for me to be a full-time Virtual Assistant, and so I’m stepping in faith! A Virtual Assistant takes care of the behind-the-scenes stuff – like social media, for example – so that you can focus on where God is leading and use your gifts fully. Thank you Kaitlyn (and Holley). This message is just what I needed to read/hear right at this very moment. My prayers for you as you start on your new adventure! *I* am so glad to hear that! Have a wonderful weekend. “Choose to believe that He’s got it all figured out and that His plans are so very good.” I love that! That truth does us little good if we don’t CHOOSE TO BELIEVE it. Thanks for your encouragement today and may God richly bless you in your future endeavors. Yes. You’re right! We’ve got to choose to believe the Truth. I really needed this, I am facing what feels like a crushing problem in my life – I go to sleep worrying about and wake up the same. All day my mind rolls it around until my shoulders scream from the tension. If I can remember to pray when I feel/become aware the habit to worry. Thank you for this!! I just want to say thank you, Holley, and to all those who share what God has placed on their heart through your ministry. God has blessed and spoke to my heart many times and I thank Him and you. Thank you for being here today, Gayla! Kaitlyn – Thank you for your message today. Congratulations on your graduation! God’s plans are always right and exciting. He knows the plans He has for you. Jeremiah 29:11 It’s awesome that you’re walking with Him and you already know! 🙂 Blessings in Him! THANK YOU KAITLYN FOR THOSE WORDS. WORRYING WILL NOT GET US ANYWHERE BUT SEPERATED FROM THE LORD. WE HAVE TO REMEMBER THAT GOD GOT THIS. MAY THE LORD BLESS YOU WITH HIS ABUNDANT HE HAVE FOR YOU WHEN YOU FINISH COLLEGE AND MAY HE LEAD YOU IN HIS WILL FOR HIS GLORY. IN JESUS NAME. I PRAY. AMEN. Congratulations on your graduation and God’s Blessings for your position as Virtual Assistant Kaitlyn! When God’s Strength becomes our Strength, together we can climb mountains!! With Holley and our Lord as your mentors over these past years you have been well trained in their love! She has definitely trained me well in how to encourage and love! Just this morning I was journaling about hope. Most times I can’t tell the difference between hope and wishful thinking. What Kaitlyn said about brought me a bit closer to this hope the bible talks about. It seems to be tied in with trust. How cool that it’s tied together throughout your day! I’m so glad that these words could encourage you. Kaitlyn you are so wise. Thank you for sharing your thoughts today. Your encouraging words are helping me through this day. As all the others above, you really have touched my heart today. Congratulations on your graduation! I’m so glad to hear that… thank you for commenting and saying so! 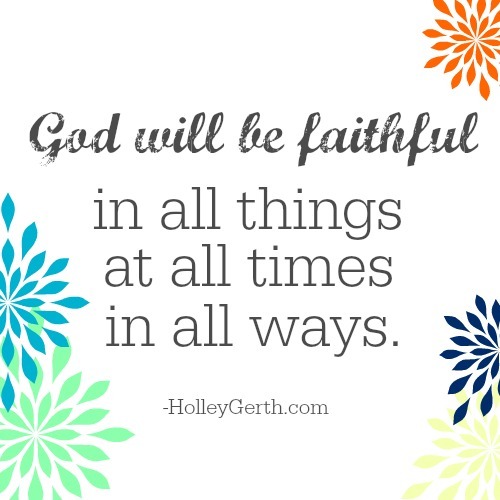 He is SO, SO faithful!. Thank you very much for sharing this today. I really appreciate what you wrote. That’s for sure. Faithful – always. I too very much needed to hear your words. Thank you very much. Also, Congratulations in your soon to be new chapter in your life. I’m so glad they blessed you, Nancy. Have a wonderful weekend! Thank you so much, Kaitlyn for your powerful words of wisdom! Holley asks us each year to search ourselves for a word that will reflect what we want to accomplish or work on for that year. My word this year was ‘intentional’ and it has powerfully allowed me to work on letting go of control and not worry about being perfect! That’s a huge thing to say for a perfectionist like me! =) But understanding that I cannot be perfect no matter how hard I try, was such a godsend for me. Christ and Christ alone is perfect ~ no one else! Holley also taught me about the difference between hoping and wishing ~ another very valuable thing to learn and apply ever single day! So thank you from the deepest part of my heart for incorporating your awesome words of wisdom into the essence of what Holley believes and teaches all of us. You are an amazing woman and I am happy you will be continuing to work with Holley. God bless you my friend!